Before it was a top tourist and retirement destination, Hilton Head Island, South Carolina, was made up of 24 cotton, rice, sugar cane and indigo plantations. Skillful planning has helped develop the land into one of the most exclusive resort and residential communities in the Southeast. The island offers residents and visitors world-class golf, water sports and luxurious resort accommodations. Hilton Head Island, located near the border of South Carolina and Georgia, is home to more than 34,000 full-time residents, and another 2.5 million people visit the island each year. At last count, Hilton Head had more than 6,000 luxury villas, 3,000 hotel rooms and 1,000 time share units available for visitors, with more being built. The demand for lodging remains high because of the island's stellar reputation as a convention host. At least 22 different properties on Hilton Head offer convention and meeting facilities.
" Hilton Head Island clings to its pristine Southern roots, offering visitors a window to the past amid the modern conveniences. ... "
The island certainly is a convention mecca, but it is most famous for its golf courses. 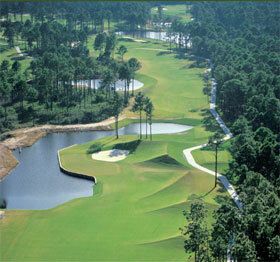 Hilton Head is home to 23 courses, many reputed to be among the best in the country. Combine that with the numerous off-island courses less than a 30-minute drive away and it is easy to see why so many people come to the island to hit the links. But there is so much more to do than play golf. The island has 300 tennis courts and eight marinas and is heaven for those who like to spend their leisure time on the water. Hilton Head also offers a full plate of cultural activities, including tours of the historic district and Gullah heritage tours. Gullah is the culture specific to the South Carolina Lowcountry, which evolved when slaves interweaved African and European cultures, creating their own customs, idioms and culture. Hilton Head Island also features top boutiques and fine dining establishments. Despite its tremendous growth in popularity among vacationers from around the world, Hilton Head Island clings to its pristine Southern roots, offering visitors a window to the past amid the modern conveniences that make Hilton Head Island such a great place to live and visit. © 2019 HiltonHeadBuilders.com HHI Builders in Beaufort & Jasper Counties. All Rights Reserved. Site design and maintenance by Media Services, Builders Marketing.